A plane crash. A mysterious transformation. An adventure unlike any other. Fourteen-year-old Gerry Copeland has mixed feelings about flying back to his parents' research camp in the African savanna. While his biologist mom and dad study baboon behavior, he'll be thinking about the video arcade and restaurants back in the city. Suddenly, their small plane's engine stutters and dies. They go down hard. Gerry wakes up thinking a baboon has broken his fall. He's shocked to realize the furry arm is his own. Somehow, he's become one of the beasts his parents are studying. Adopted by baboons, Gerry's only chance to survive is to stay with the baboon troop. His parents don't recognize him, and he begins to lose hope he'll ever be human again. His final, desperate bid to turn back means giving up the animal family he's come to care about for the human family where he truly belongs. 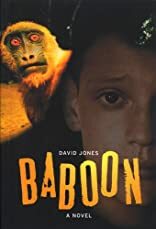 Baboon is the riveting story of one teenager's journey into the heart of the baboon world, where he confronts terrifying attacks by predators and humans, threatening behavior within the troop, and the day-to-day struggle to survive.